Jenkitkasemwong, S., Wang, C. and Knutson, M. D. (2016). Measurement of Transferrin- and Non-transferrin-bound Iron Uptake by Mouse Tissues. Bio-protocol 6(17): e1922. DOI: 10.21769/BioProtoc.1922. Iron in blood plasma is bound to its transport protein transferrin, which delivers iron to most tissues. In iron overload and certain pathological conditions, the carrying capacity of transferrin can become exceeded, giving rise to non-transferrin-bound iron, which is taken up preferentially by the liver, kidney, pancreas, and heart. The measurement of tissue transferrin- and non-transferrin-bound iron (TBI and NTBI, respectively) uptake in vivo can be achieved via intravenous administration of 59Fe-labeled TBI or NTBI followed by gamma counting of various organs. Here we describe a detailed protocol for the measurement of TBI and NTBI uptake by mouse tissues. 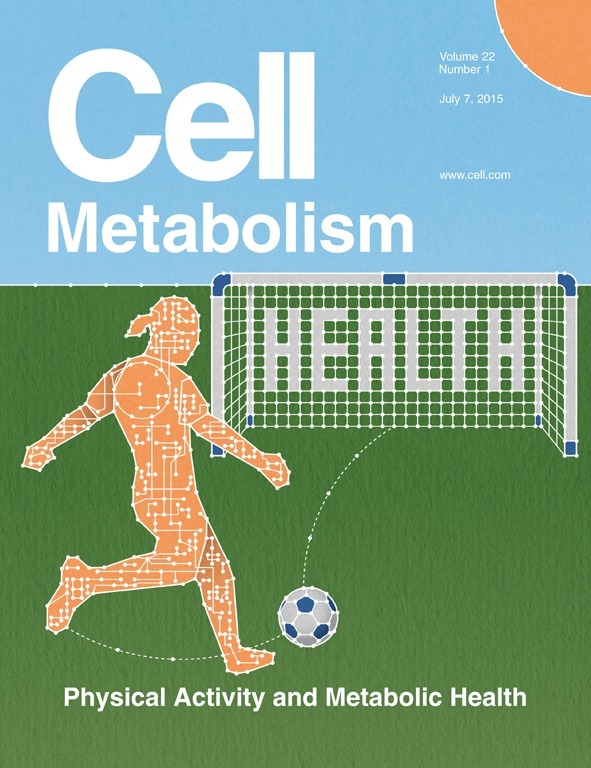 Note: The minimum specific activity of 59Fe we have used to obtain decent signal from our gamma counter was 0.2 Ci/mmol at the concentration of ~3 µCi/µl, which gave whole body counts per minute of ~100,000 per each animal. Our gamma counting efficiency is about 10% for 59Fe. Prior to gamma counting, empty gamma counting tubes are measured to ensure no 59Fe contamination (i.e., < 25 CPM = background). For tissue NTBI uptake measurement, inject 0.1 ml of ferric citrate solution (containing 70 µg iron) to a mouse via tail vein to transiently saturate the iron-binding capacity of plasma transferrin. This step is required so that any subsequently injected iron will not bind to transferrin and hence will be non-transferrin-bound iron (NTBI). Return the mouse to the cage and wait for 10 min before going to step 2. See Figure 1 for a typical injection station setup. For tissue TBI uptake measurement, inject 0.1 ml of 59Fe-labeled transferrin (containing 150 µg transferrin) to a mouse via tail vein. Return the mouse to the cage and wait for 2 h before going to step 3. Inject 0.1 ml of 59Fe-labeled ferric citrate solution (2 µCi) to the mouse via tail vein. Return the mouse to the cage. Two hours after injection of 59Fe-labeled ferric citrate solution (for NTBI uptake) or 59Fe-labeled transferrin (for TBI uptake), euthanize the mouse with an overdose of isoflurane or other proper methods and place the mouse on an absorbent pad. Cut the mouse tail off to remove residual 59Fe radioactivity that is retained in the tail (i.e., radioactivity that did not enter the circulation). See Figure 1 for a typical harvesting station setup. Sterilize the mouse abdomen and chest area with 70% ethanol. Open the abdominal cavity with blunt-end sterile scissors and collect tissues of interest (e.g., pancreas, spleen, liver, kidney, etc.). Then open the chest cavity to collect tissues such as lung and heart. Rinse tissue in 0.9% NaCl solution poured in a disposable weigh boat and remove excess liquid by dabbing the tissues on a stack of paper towels. 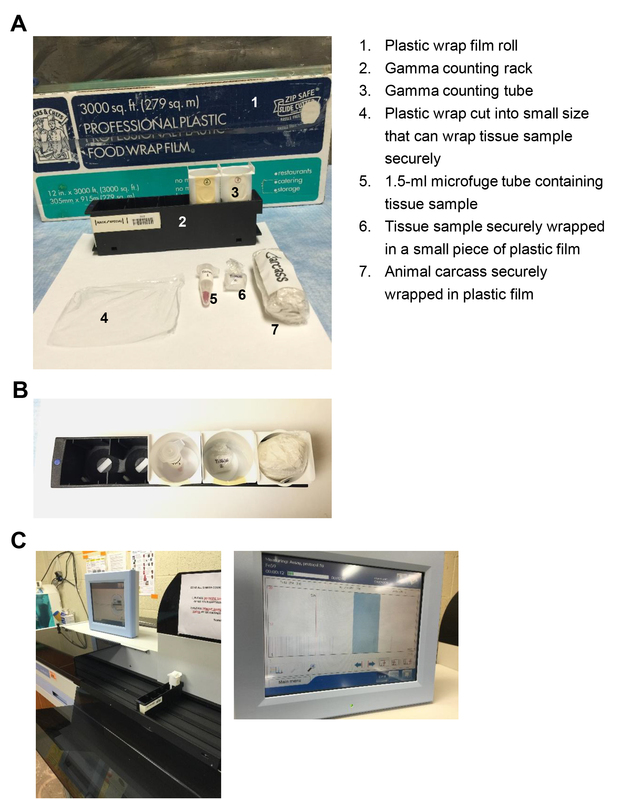 Use plastic wrap to wrap each tissue briefly prior to transfer into a gamma counting tube to minimize cross contamination of 59Fe radioactivity between samples. Optionally, transfer tissue to a clean 1.5-ml microcentrifuge tube if the tissue sample can fit in it. 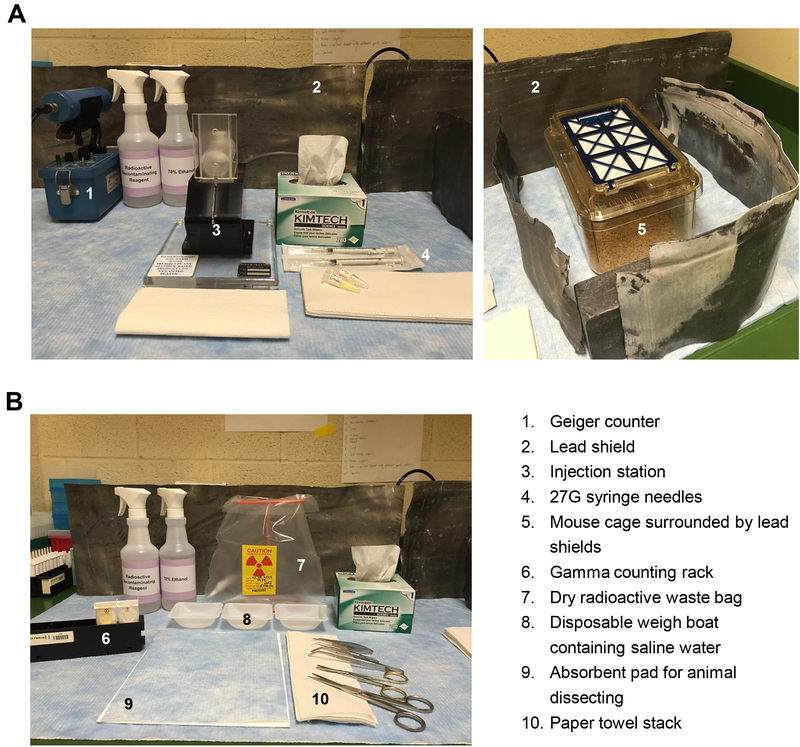 Then measure the tissue radioactivity using a gamma counter by putting the 1.5-ml tube containing the tissue sample into a gamma counting tube rack (see Figure 2). For the mouse carcass, use plastic wrap to securely wrap the whole carcass prior to transfer into a gamma counting tube (see Figure 2). Figure 2. Illustration of radioactive tissue handling and loading to gamma counting tubes prior to measurement by a gamma counter. A. Materials required for tissue sample wrapping. B. Top view of the gamma counting rack with previously wrapped samples loaded in each gamma counting tube. C. The gamma counting rack containing the sample tube is placed on the rack belt of the gamma counter, ready to be loaded inside the gamma detector (left panel). The gamma counter screen showing real-time radioactivity being detected from the tissue sample (right panel). Measure organ and carcass 59Fe radioactivity by using a gamma counter. Calculate tissue NTBI and TBI uptakes as a percentage of whole-body counts per minute (CPM) (whole-body CPM = CPM values from all tissues + CPM value from carcass) (see Figure 3). Figure 3. Example of raw data and analysis of results. Two hours after injection with 59Fe-labeled ferric citrate, WT and Zip14 KO mice at 3 weeks of age were sacrificed and their tissues and carcasses were subjected to gamma counting. A. Counts per minute (CPM) values from each sample were recorded. Whole-body CPM values were calculated from the sum of all tissues and carcass CPMs. B. Tissue 59Fe accumulation is expressed as % of whole body and calculated as (tissue CPM/whole body CPM) x 100. C. Resultant figure from panel B is shown. Data were analyzed by using unpaired student’s t-test. Values are means ± SE (n = 3/group). ***P < 0.001, **P < 0.01. After each experiment, use radioactive cleaning reagent to clean the surgical tools, mouse cages, and related equipment to decontaminate 59Fe. Perform a radioactive swipe test on the related equipment and area where the experiment is performed after each experiment to ensure no contamination is observed. Radioactive waste products should be disposed of by following your local Environmental Health and Safety (EH&S) regulations. To 450 ml ddH2O, dissolve 2.38 g HEPES and 1.21 g Tris. Adjust pH to 6.0 with 10 N HCl. Bring final volume to 500 ml with ddH2O. In 20 ml 20 mM HEPES/20 mM Tris buffer, add 4.28 g NTA. Adjust pH to 6.0 with 10 N NaOH by adding ~3 ml of 10 N NaOH at the beginning then drop-wise until pH reaches 6.0 (Caution: pH changes rapidly between pH 5-7). Bring final volume to 56 ml with 20 mM HEPES/20 mM Tris buffer. To make 100 mM HCl, add 500 µl of 37% (equivalent to 12 M) HCl solution to 11.5 ml ddH2O. Dissolve 1.08 g FeCl3·6H2O in 10 ml 100 mM HCl. In a 50 ml beaker with stir bar inside, add 10 ml of 20 mM HEPES/20 mM Tris buffer. Leave the pH electrode inside the solution and track the solution pH along the rest of the procedure. Add 2 ml of 0.4 M FeCl3 prepared in step 1c. The solution pH should now be ~2. Add 8 ml of 0.4 M NTA prepared in step 1b. Adjust to final pH of 6.95 with 100 mM NaOH. Bring final volume to 40 ml with 20 mM HEPES/20 mM Tris buffer. Filter sterilized the 20 mM Fe-NTA solution through 0.45 µm filter unit. To 40 ml ddH2O, dissolve 2.25 g Na3C6H5O7·2H2O (tri-sodium citrate dihydrate). Adjust pH to 6.6 with 10 M HCl. Bring final volume to 50 ml with ddH2O. For 50 ml stock, add 0.169 g FeCl3·6H2O to 50 ml 0.1 M citrate buffer. To 100 µl 0.1 M citrate buffer, add 2 µCi 59FeCl3. To 50 ml PBS, add 0.042 g NaHCO3. Add 7.5 mg apo-transferrin to 5 ml NaHCO3 in PBS buffer prepared in step 4a. Add 2.5 µl 59FeCl3 to 12.5 µl of 20 mM Fe-NTA solution. Mix solutions prepared in steps 4b and 4c. Incubate at RT for 1 h to allow 59Fe to bind to transferrin. Remove unbound 59Fe by using AmiconTM Ultra-15 centrifugal filter unit. Add 4 ml of 59Fe-labeled transferrin prepared in step 4d to an AmiconTM Ultra-15 centrifugal filter unit. Centrifuge at 5,000 x g for 20 min at RT, discard eluate in a radioactive waste container. Add 4 ml 10 mM NaHCO3 (prepared in step 4a) to the filter unit and centrifuge at 5,000 x g for 20 min at RT, discard eluate. Repeat step eiii for 3 additional times. In last wash, you may wish to measure 59Fe radioactivity found in the eluate to ensure that the 59Fe not bound to TBI has been thoroughly removed. The eluate 59Fe radioactivity of greater than 30 CPM may indicate the requirement for additional washes. Add 4 ml of 10 mM NaHCO3 buffer on top of the filter unit and collect all the retentate (which contains the newly added 4 ml of 10 mM NaHCO3 and the 59Fe-labeled transferrin, making the collecting volume to ~4 ml) into a fresh 5 ml tube. 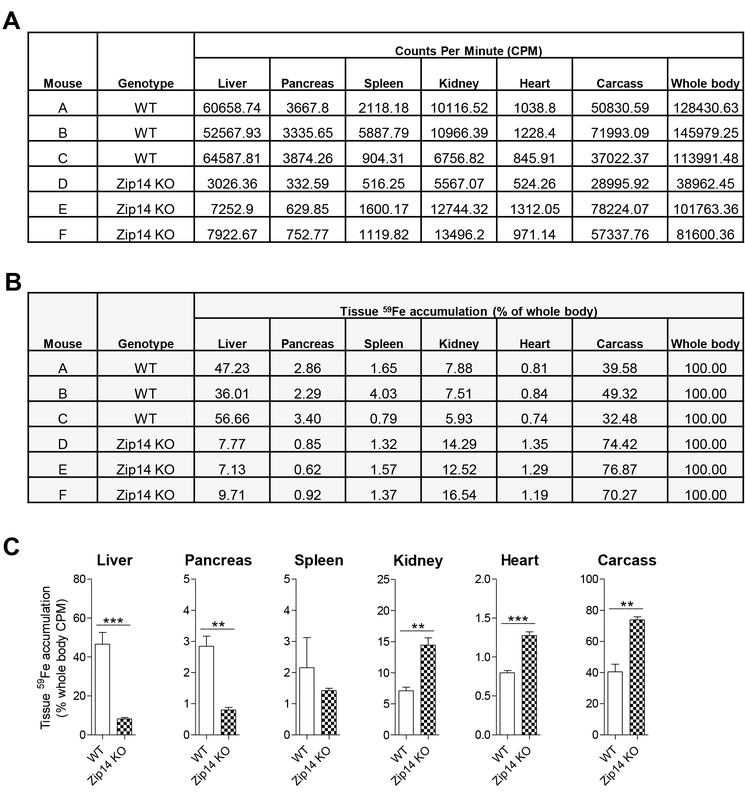 Measure 59Fe CPM of the 59Fe-labeled transferrin solution to ensure sufficient radioactivity to be able to detect tissue-associated 59Fe from each animal (desirably ~10,000 CPM/100 µl 59Fe-labeled transferrin solution). Store at 4 °C until use for tail vein injection. To every 1 L of ddH2O, add 9 g of NaCl. Autoclave to sterilize and store at 4 °C until use. This work was supported by the National Institutes of Health grant DK080706 (to M.D.K.). The protocol was adapted from Craven et al. (1987), and a short version of the adapted protocol was published in Jenkitkasemwong et al. (2015). Craven, C. M., Alexander, J., Eldridge, M., Kushner, J. P., Bernstein, S. and Kaplan, J. (1987). Tissue distribution and clearance kinetics of non-transferrin-bound iron in the hypotransferrinemic mouse: a rodent model for hemochromatosis. Proc Natl Acad Sci U S A 84(10): 3457-3461. Jenkitkasemwong, S., Wang, C. Y., Coffey, R., Zhang, W., Chan, A., Biel, T., Kim, J. S., Hojyo, S., Fukada, T. and Knutson, M. D. (2015). SLC39A14 is required for the development of hepatocellular iron overload in murine models of hereditary hemochromatosis. Cell Metab 22(1): 138-150. How to cite: Jenkitkasemwong, S., Wang, C. and Knutson, M. D. (2016). Measurement of Transferrin- and Non-transferrin-bound Iron Uptake by Mouse Tissues. Bio-protocol 6(17): e1922. DOI: 10.21769/BioProtoc.1922.